Connors Basics is operated by Connors Office Products Ltd., and has been family owned & operated since 1983. There are currently three Connors family members working within the organization, along with eighteen loyal & dedicated staff members, which helps to ensure that customer service and quality remains our number one goal. 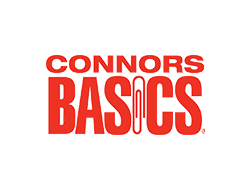 In July 1996, Connors Office Products Ltd. joined the BASICS buying group and changed their operating name, to reflect these alliances, to Connors Basics. While no operating or ownership changes were made and the company remains 100 % locally owned, the name change helped establish Connors Basics as a member of a nationwide organization.